Day 2. The early flight from Bangkok meant we had to leave at 4:30am even though our flight wasn't until 7:00. The flight time was only an hour and once we'd landed in Surat Thani and picked up our luggage we bought bus and ferry tickets to Koh Samui. We were lucky and instead of the usual coach we got a much speedier mini bus (and only paid for the slower coach). The mini bus took around 1.5 hours and when we got to the port we hopped out of the bus, ran through the rain to get onto the ferry that was departing only minutes later. 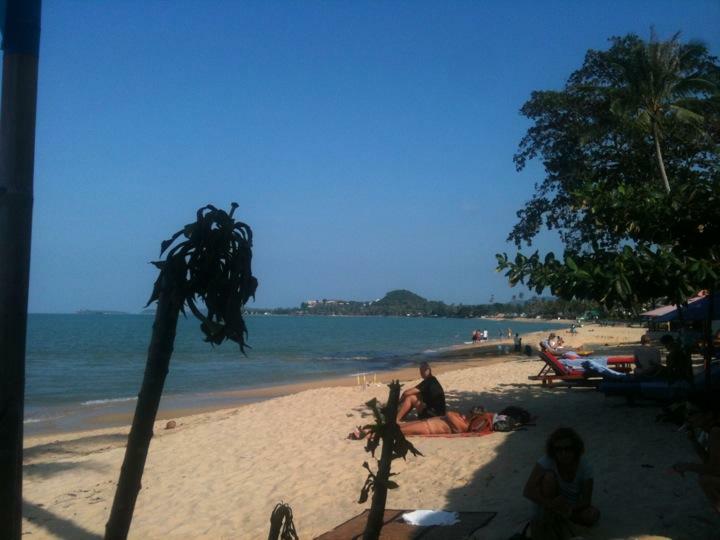 We got to Koh Samui after a few hours on the slow ferry and upon disembarking were shocked by taxi prices. The taxi mafia had a solid grip on the island and the 15 minute journey was set to cost us 500 baht (£10). The trip through Bangkok to the airport for 45 mins cost us under half that! Luckily, after some searching and no joy haggling, we found a Thai couple that were going our way and we shared the cost (still expensive though). We arrived at our hotel "Hacienda Beach Resort" at around 4pm and checked in. We were showed to our very pleasant looking bungalow which overlooked a small garden area and was a short walk away from a private beach area. We were a little disappointed to see no attempt to make the resort Christmassy at all despite it being French owned and run (no decorations, no music, meal or activities). The main concern for us on arrival though was that we were in an area called Maenam (no relation to Gangnam), it was very quiet and it didn't seem close to much else which would mean lots more expensive taxis to come (no public buses on the island). Afterwards, in the evening we went for some excellent and cheap Thai food at a nearby restaurant, that turned out to be owned by a German guy. Day 3. After a rainy night we wake up to a cloudy Christmas eve. The main aim of today was to visit the nearby tourist town Chaweng. We wait on the Maenam main street and jump onto the back of a songtaew which is a pickup truck with benches to sit on in the back. The trip is 20 minutes and costs us 100 baht each. The main reason to visit Chaweng was to pick up some final Christmas stuff and to find a place to eat the next day. So we wander up and down the main street looking a various restaurants, cafes and shops. We finally decide to book a meal for the next day at the British-esque pub called the "Rose and Crown" for around 900 baht (the cheapest on the road) which included a 3 course meal and a free cocktail. As we hadn't really eaten much today (neither of us were feeling great) we had a sausage sandwich before heading back on a songtaew to Maenam in the mid afternoon. When we got back we took in turns to wrap presents, then we took our clothes to be washed. In the evening we went to a local restaurant for some cheap noodles (Pad Thai). After the local we headed to the nearby 7 Eleven and got soft drinks and sweets which we tucked into later in the evening whilst we watched films on TV and DVDs. We had to try and make it feel more Christmassy somehow and this worked well. Day 4. Christmas Day! We got up gave each other our presents. I got Alicia some opal earrings from Oz to go with her necklace. I got a new pair of awesome "magic pants" (they'd be worn for about 2 weeks straight after Christmas) and a stocking (made out of wrapping paper) filled with classic Christmas goodies like chocolate coins, gummy pizzas and pistachio nuts. Alicia had also been up for a while before hand cutting out snowflakes and "Merry Christmas" out of the spare paper and stuck it on our bay doors. After I had a shower, I picked up our washing which was done just in time as we were heading to church later and I had 0 clean clothes. We found 2 cheap motos (scooter taxis) hanging out on the street that took us to the church near Chaweng for 50 baht each. We arrived at 10:40am for their English Mass. The mass lasted for about an hour or so and then was surprisingly followed by a buffet laid on by the church including curries, rice, bread, drinks and cakes. We snacked casually as we didn't want to spoil our food (Alicia was starting not to feel too well either). After church we left to walk to Chaweng, giving us enough time to walk their comfortably. Lucky, because we got a little lost and arrived at our meal exactly the time of our reservation, at 1:30pm. We were shown to our table and was greeted by giant colourful hats, party poppers and a Ferrero Roche straight from the fridge...nice. We both had soup and bread for starters and no sooner as we finished, our main was being brought out. It was pork, turkey and beef main course with stuffing, yorkshire pudding, cauliflower, broccoli, carrots, brussels, thick gravy, the works (almost - no pigs in blankets though) as well as a colourful cocktail which reminded you of the fact this wasn't a usual Christmas (if the warm weather didn't do that anyway). We were so stuffed after the meal we had to put off desert twice (neither of us had eaten properly for about a week due to illness so this was a mammoth effort). We did eventually give in on the third time of asking and got a great Christmas pud and custard. Not that we could finish it. After the meal we waddled to a songtaew and took it back to Maenam where we headed to the beach for a cocktail on the sand at a beach bar (Alicia was feeling worse than in the morning so had a non alcoholic one). Whilst they prepared the drink I went for a swim in the ocean before it got dark (about 4:30pm when I got out) and Alicia spoke to her family. In the evening, I spoke to my family and we watched a Christmas film on DVD and ate our way through the stocking. Perfect. Day 5. Boxing day. We got pretty lucky with the weather on Christmas Day as although it was mostly overcast it was bright, warm and still. Boxing day though the weather wasn't great, the sky was full of grey clouds, was a little drizzly and a bit of a wind which was enough to make the sea pretty uninviting. So we pretty much resigned ourselves to a lazy day doing nothing. We watched many films until the evening, when we finally eventually ventured outside at about 5pm. We went back to the German owned restaurant and we both ordered what I had on the first night. This time it was no were near as good, it was just Christmas dinner left overs with the reheated veg and scraps of meat in a strange gravy/Thai sauce. Well, it was Boxing Day I suppose. Left overs are traditional. Later we got yet more chocolate and biscuits from the 7 Eleven and watched yet more TV and films in the room. Day 6. I got up early, left Alicia sleeping and and went diving with the only dive school that had space left over the Christmas period. I was picked up at 7:30am along with someone who was in the bungalow next to us (random coincidence). When we arrived at the boats, I had a toast breakfast as the boat was loaded. When it was all ready we jumped on and took the speed boat for 45 minutes to Sail Rock. The ride was very choppy and some people were already feeling a little ill, when the boat stopped near the rock though the rolling motion really got to a lot of people on the boat (luckily I was ok). We had a short briefing that recapped the basics and detailed what we could see including Bull Sharks, Barracuda, big schools of other big predatory fish and if we were lucky Whale Sharks. Exciting stuff. After getting ready we jumped in for first dive. We swam back and forth around one side of the rock (which jutted out of the middle of the ocean) we did try to swim around the other side of the rock but after 5 minutes of swimming into the very strong current we had actually gone backwards. So we just went up and down the side of the rock. There wasn't a great deal to see. We saw two big triggerfish and a batfish or two but the highlight was an extremely poisonous and camouflaged stone fish. The dive started at 9am and lasted for for 45 minutes. Back on boat we rested, had a drink of cola and water and a sandwich. Whilst the boat stayed still for 50 minutes it was nice to be in the sun, but the wind and the choppiness of our small boat made many people physically sick, so they'd be unable to do the second dive. This was like a catch 22, because getting in the water and off the boat was the only thing that'd relieve some of the sickness. Before we went back in the water for the second dive though we had to go and rescue some other divers that had been taken a long way out by the current and when they got on board looked extremely tired. Unfortunately this completely ruled out the boat dropping us off the backside of the rock, letting the current take us round the rock and the boat picking us up on the other side. This meant no schools of barracuda, travele or sharks. A major blow to the dives. The second dive was in the same place and once again dived back and forth on the rock face. We saw much of the same, saw nudibrancs and the highlight was a small moray eel poking itself out of the rocks. This dive was for 46 minutes to 18 metres. The visibility was terrible on both dives which perhaps didn't help (about 5 metres). Nothing on Oz or what Thailand can offer in the way of diving (I have heard many stories of it being better than the GBR on the right day). But it was nice to be back underwater again. After the second dive we headed back to land much to the relief of most of the boat. We finally got back around 1:30pm before heading back to the hotel. Not much happened until dusk when we headed out into Maenam to walk around the travelling night market that went to different parts of Samui on different days. Walking around was a good laugh, there was a pretty descent rock band that had set up in the street and played rock classics like Stefanwolf. We bought a cocktail from a stand and a slice of pizza from a street vendor. I also purchased the most ridiculous invention ever, glow in the dark sunglasses. Genuine Ray Bans don't you know? Day 7: We packed, checkout and after a bit of an effort to find a pier, we got a songtaew to Big Buddha (an area of Samui). We bought our tickets and queued in the heat of mid morning. There was a bit of a scramble of tourists to get on the two ferries before they filled. We were one of the last groups let on. The ferry then took an hour or so to reach our destination at Koh Phangan, home of the Full Moon Party.